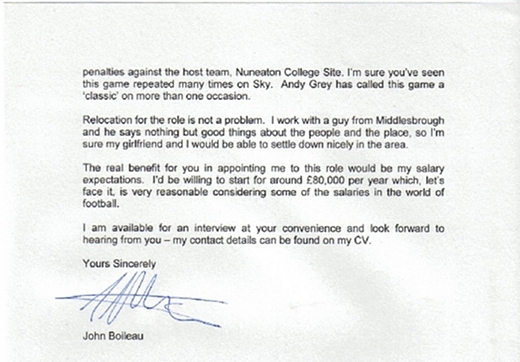 In May of 2006, armed only with a glittering virtual career on Football Manager 2005 and limited success in charge of a local under-11s team, then-25-year-old John Boileau made the leap and applied — with tongue firmly in cheek — to become the new manager of Middlesbrough Football Club. 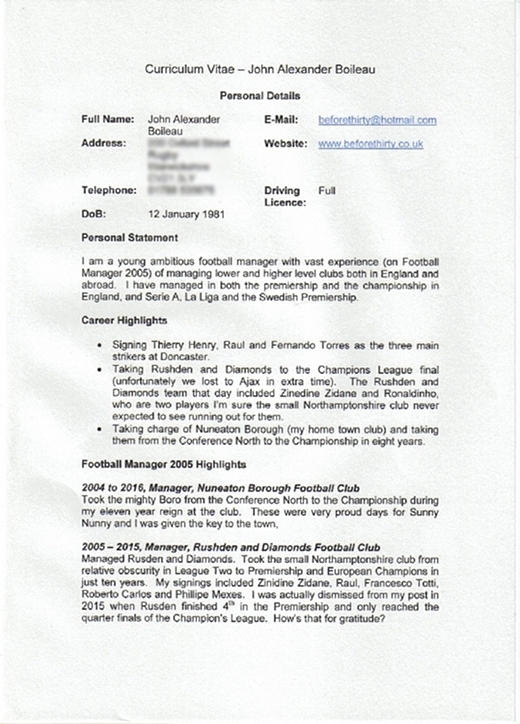 Below are his covering letter and CV as sent to the club's chairman and owner, multi-millionaire Steve Gibson. Also below is Gibson's fantastic response. 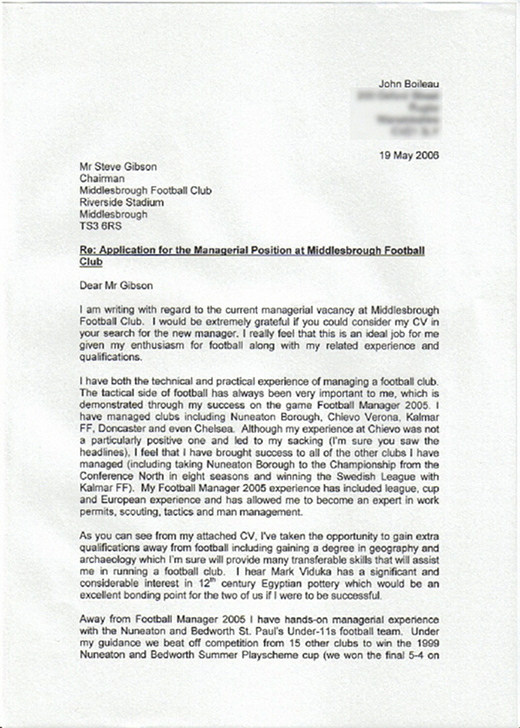 I am writing with regard to the current managerial vacancy at Middlesbrough Football Club. I would be extremely grateful if you could consider my CV in your search for the new manager. I really feel that this is an ideal job for me given my enthusiasm for football along with my related experience and qualifications. I have both the technical and practical experience of managing a football club. The tactical side of football has always been very important to me, which is demonstrated through my success on the game Football Manager 2005. I have managed clubs including Nuneaton Borough, Chievo Verona, Kalmar FF, Doncaster and even Chelsea. Although my experience at Chievo was not a particularly positive one and led to my sacking (I'm sure you saw the headlines), I feel that I have brought success to all of the other clubs I have managed (including taking Nuneaton Borough to the Championship North in eight seasons and winning the Swedish League with Kalmar FF). My Football Manager 2005 experience has included league, cup and European experience and has allowed me to become an expert in work permits, scouting, tactics and man management. As you can see from my attached CV, I've taken the opportunity to gain extra qualifications away from football including gaining a degree in geography and archaeology which I'm sure will provide many transferable skills that will assist me in running a football club. I hear Mark Viduka has a significant and considerable interest in 12th century Egyptian pottery which would be an excellent bonding point for the two of us if I were to be successful. 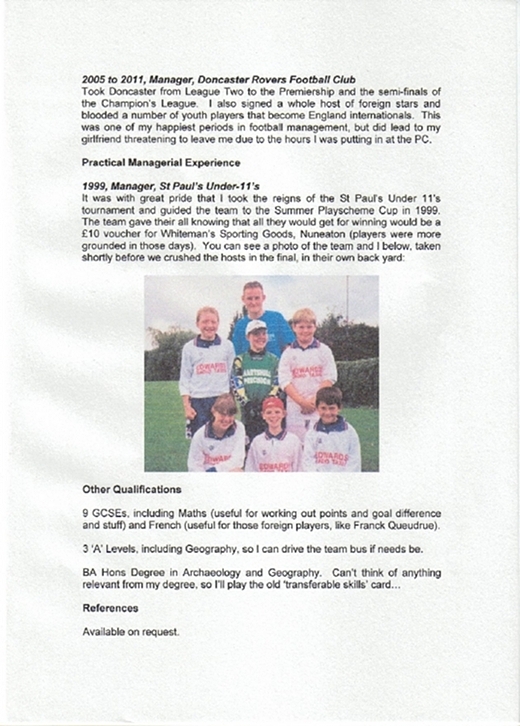 Away from Football Manager 2005 I have hands-on managerial experience with the Nuneaton and Bedworth St. Paul's Under-11s football team. Under my guidance we beat off competition from 15 other clubs to win the 1999 Nuneaton and Bedworth Summer Playscheme cup (we won the final 5-4 on penalties against the host team, Nuneaton College Site. I'm sure you've seen this game repeated many times on Sky. Andy Grey has called this game a 'classic' on more than one occasion. Relocation for the role is not a problem. I work with a guy from Middlesbrough and he says nothing but good things about the people and the place, so I'm sure my girlfriend and I would be able to settle down nicely in the area. The real benefit for you in appointing me to this role would be my salary expectations. I'd be willing to start for around £80,000 per year which, let's face it, is very reasonable considering some of the salaries in the world of football. I am available for interview at your convenience and look forward to hearing from you - my contact details can be found on my CV. I am a young ambitious football manager with vast experience (on Football Manager 2005) of managing lower and higher level clubs both in England and abroad. I have managed in both the premiership and the championship in England, and Serie A, La Liga and the Swedish Premiership. Signing Thierry Henry, Raul and Fernando Torres as the three main strikers at Doncaster. Taking Rushden and Diamonds to the Champions League final (unfortunately we lost to Ajax in extra time). The Rushden and Diamonds team that day included Zinidine Zidane and Ronaldinho, who are two players I'm sure the small Northamptonshire club never expected to see running out for them. Taking charge of Nuneaton Borough (my home town club) and taking them from the Conference North to the Championship in eight years. Took the mighty Boro from the Conference North to the Championship during my eleven year reign at the club. These were very proud days for Sunny Nunny and I was given the key to the town. Managed Rusden and Diamonds. Took the small Northamptonshire club from relative obscurity in League Two to Premiership and European Champions in just ten years. My signings included Zinidine Zidane, Raul, Francesco Totti, Roberto Carlos and Phillipe Mexes. I was actually dismissed from my post in 2015 when Rusden finished 4th in the Premiership and only reached the quarter finals of the Champion's League. How's that for gratitude? Took Doncaster from League Two to the Premiership and the semi-finals of the Champion's League. I also signed a whole host of foreign stars and blooded a number of youth players that became England internationals. This was one of my happiest periods in football management, but did lead to my girlfriend threatening to leave me due to the hours I was putting in at the PC. 9 GCSEs, including Maths (useful for working out points and goal difference and stuff) and French (useful for those foreign players, like Frank Queudrue). 3 'A' Levels, including Geography, so I can drive the team bus if needs be. 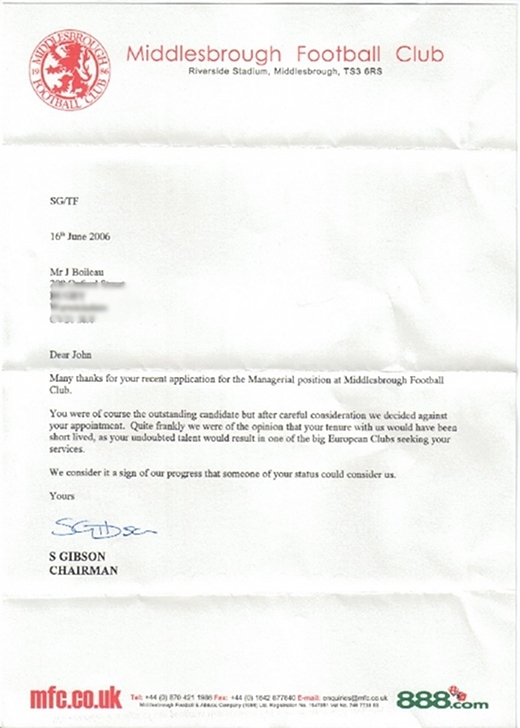 Many thanks for your recent application for the Managerial position at Middlesbrough Football Club. You were of course the outstanding candidate but after careful consideration we decided against your appointment. Quite frankly we were of the opinion that your tenure with us would have been short lived, as your undoubted talent would result in one of the big European Clubs seeking your services. We consider it a sign of our progress that someone of your status could consider us.